This Week On "My Talent Corner"
Every student holds a different place in my heart. As for Rose, it is like enjoying time with your grandmother. She is multi-talented. She is a wonderful baker. No we're not talking sugar cookies. She bakes as if they came from a bakery. Fancy looking and rich tasting. So when I come over for the class she ask if I want a cup of coffee. My thoughts are - Is there some baked goods that go with that cup of coffee? Yum, yum I can't wait until our next class. But she also has a love for her knitting. I just have to praise her for a job well done. She is a return knitter that has been excited to learn what is new in the knitting world. Now I usually don't ask age, but in Rose's case I want to stress the point that it is never too late to return back to something you enjoyed doing. Rose is 80 years old. Rose made this beautiful sweater that has a touch of fair isle and this adorable hat with a fun topper for her grandchild. She made it with such care and much love. Thank you Rose for taking out the time to share. Miss Craft Diva: When did you first learn to crochet? Rose: My husband was in the service so I must have been about 22 or 23 and that's about 50 some odd years ago. Miss Craft Diva: How did you learn? From a family member, friend, or organization? Rose: I learned from a book so I was self taught. Miss Craft Diva: Why do you enjoy knitting so much? Rose: It's a form of relaxation and seeing the end product and a sense of accomplisment. Rose: I would like to make a shawl, pot holders and I want to make a sweater coat for myself. Miss Craft Diva: What benefits do you get from knitting? Rose: Accomplishment, relaxation, crativity and the challenge of doing something new with working on different projects. Miss Craft Diva: What are other goals that you want to achieve with your knitting? Rose: I want to learn how to interprete patterns and learn different stitch patterns. I look forward to seeing those other projects from Rose, especially the sweater coat. Snow, snow go away, please don't come back another day. Well, I should rephrase that. If I am inside with a hot cup of cocoa with whip cream on top looking out my window at the snow coming down I am fine. Snow is beautiful until you have to shovel your car out and drive in it. But what a wonderful day to stay home and work on your needle art projects. That's what I did and I truly enjoyed myself. Of course, I got all excited about starting a new project and I did. Well a couple of new projects. People are always asking me how long did it take to make such and such. I say I don't know. The truth of the matter is that I have several projects going on at the same time and so I do them in my time. Come on, admit it. I know I have company out there that do the same thing. When I use to be all into sewing, I use to love to hand sew and didn't mind sewing on buttons and I did other hand work. Now not so much. So I usually enjoy the process of knitting and crocheting and then put it down for a rest until that day comes when I want to do the hand work like seaming, sewing on buttons or picking up stitches. You do have to know yourself and what you enjoy. You also have to add into the mix the things that are not on the top of your list and work them in. I like breaking down my projects and I find that I enjoy the process so much better. So what are a couple of projects I worked on in this crazy weather of ours? This is a scarf. Just using stockenette stitch and garter stitch with alternating two different size needles for each stitch you get this very textured design and I like that. These are adorable baby booties but I am at that part of the process I don't enjoy - picking up stitches. So we will see how long it takes me to get into the mood to finish these. I have until May because that is when our guild will have their baby shower for charity. And last but not least you have to make time to make a baby shower gift. There is a guy where I work temporary, him and his wife are expecting their first baby. He is such a nice person and so this picture is showing the start of a baby blanket. Well that is it for now and I'm sure you have some wonderful projects that you enjoyed especially if you live on the east coast where this weather is giving us a taste of winter. One of the areas on my blog that I would like to do more of is talk about what my students are doing with what they are learning and their love of the needle arts. I'm proud of my students and want to show off their projects. One of those students is Susan. She came to my crochet class already knowing how to crochet and in the round at that. She makes wonderful stuffed objects as you can see below. This is just a small sample of the wonderful crochet items she has enjoyed making. But she wanted to improve on her crochet skills and techniques. Susan is energetic for crochet and she would hang on to every word that I said to see what she could learn next. I enjoy her drive for learning more and I know she will continue to make beautiful pieces for years to come. Thank you Susan for taking out the time to share. Susan: I learned basic stitches (chain, single crochet, double crochet) as a child. Susan: I learned from my grandmother. I spent my afternoons and evenings with my grandmother, since both my parents worked. I would watch her crochet intricate designs as pillow and seat covers. One day, she showed me how to do basic stitches. Since I did not practice or have my own kit, I forgot it soon after. When I was 28, I went to my parents' apartment to celebrate my mom's birthday. I was moving out of state soon. When I got there, I asked my mom what she wanted to do and she replied, "How about I show you how to crochet?" I said, "Ok." We went to a local sewing supply store and picked up some yarn and a crochet hook. She showed me how to do a chain, single crochet, double crochet and treble. By dinner time, I already crocheted a scarf for my dad. Miss Craft Diva: That is wonderful that the joy of crochet was passed down to you going through three generations; your grandmother, your mother and then you. Why do you enjoy crocheting so much? 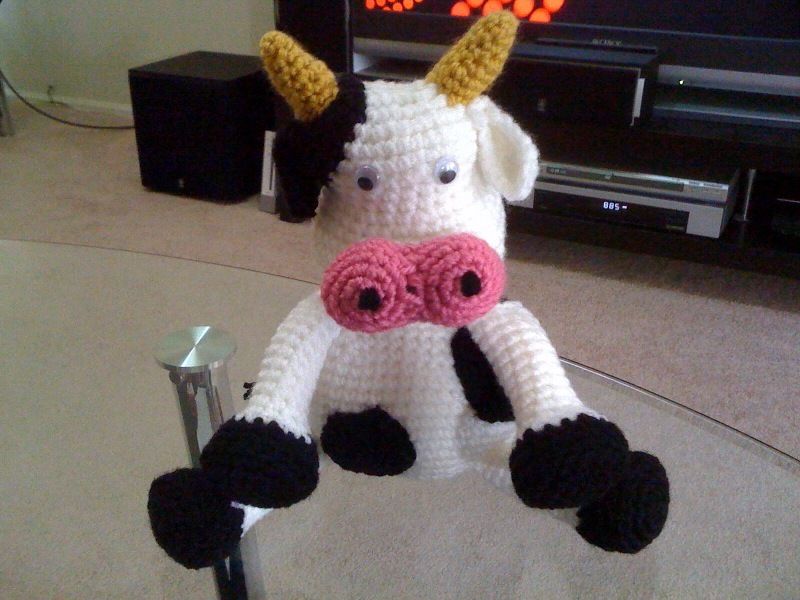 Susan: I find crocheting to be relaxing and a great stress reliever. I also enjoy it, because it was a bonding experience I shared with my grandmother and mother. Susan: I would like to make a couple of handbags, a skirt and shrug to get more practice with gauge. 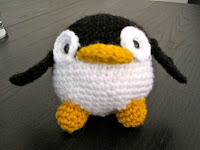 I would like to make some more stuffed animals for fun. Susan: I find crocheting to be relaxing. I also get a sense of satisfaction when I see a finished project. When most people hear I crochet, they make fun of me and say "that's for old ladies." Then I show them pictures of stuff I've made and they are impressed and can't believe I made it by crocheting. Some even say they want to learn afterwards. I'm proud that I can alter some people's perspective of crocheting. 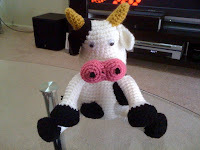 Miss Craft Diva: What made you want to crochet? Susan: As a child, I admired the beautiful, intricate patterns my grandmother made for her pillow and seat covers. When I was older, I started crocheting because that's what my mother wanted to do on her birthday. It turned out to be fun, so it became a new hobby. Susan I am so glad that you did not allow the opinions of others to stop you from being creative. Recently, Susan has enjoyed working with the V-stitch as she makes blankets for a couple of babies on the way. We look forward to seeing what else Susan will be making as she continues to release her creative spirit. The last thing you want to do when you are sick is to write. So I had to put my blog yet again on hold for a few days. Tis the season to share - GERMS! And when you are surrounded by them you are bound to pick up a few. As I spoke in recent posts, I am working with my existing stash of yarns. I've been wanting to make an infinity scarf. I didn't want to figure out the number of stitches I needed so I looked for an easy knit pattern that I could use several colors with. Actually, a no brainer and a project that I could bring to knitting groups so I don't have to think. Well, I finished the scarf even before I went to any group because I enjoyed working with the colors I picked out. As you can see from the picture, I had a varigated yarn with several colors to work with. I looked at all the colors in the yarn and then I had to find yarns that I had that could match with the blend of colors. So I picked out four solid light colors that blended and took those light colors and found four solid dark colors of the same color family. I alternated between using a solid and then varigated and I repeated that throughout the scarf. I loved the flow of the colors. Sometimes it might take a while to figure out what you will do with those one skeins of yarn or left over yarn balls. Don't rush it, just keep your eyes open to project ideas and it will happen. It did for me and I love my infinity scarf.